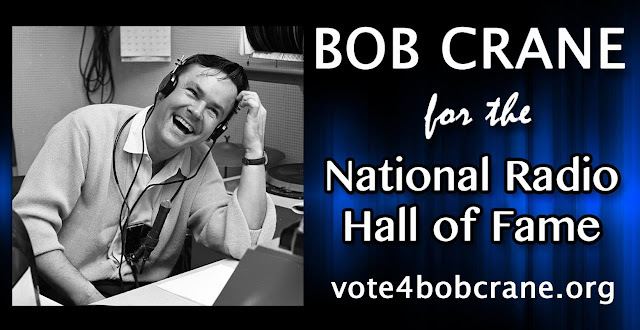 Interested in nominating Bob Crane for the National Radio Hall of Fame but unsure of what to say? We're here to help! Below is a sample template that you can use to submit your nomination for Bob. The information below is based on extensive, corroborated research and is published in Bob Crane: The Definitive Biography. Feel free to use any of this information below in your nomination for Bob Crane. 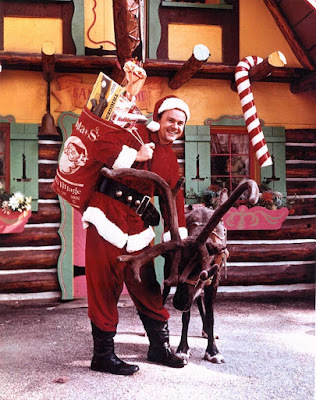 Click here to view our biosketch of Bob Crane. 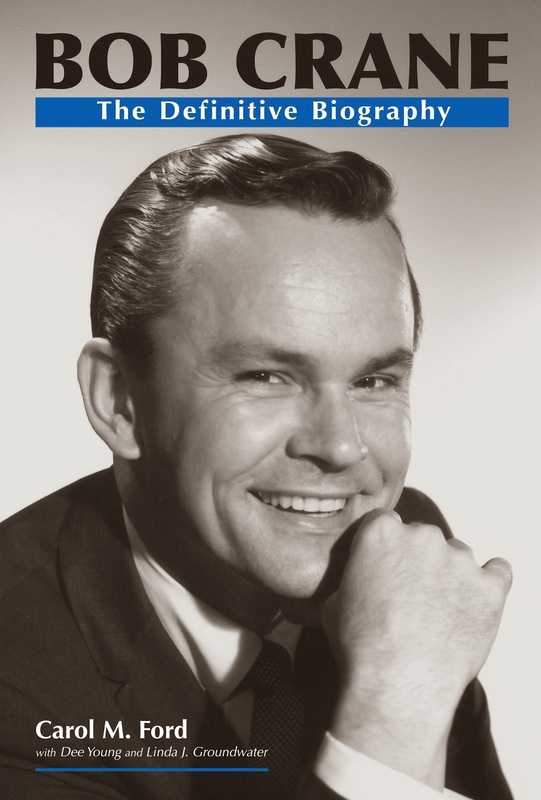 Click here for Bob Crane's radio legacy. Bob Crane was born in Waterbury, CT, on July 13, 1928, and grew up in Stamford, CT. After graduating from high school in 1946, Bob joined the National Guard. He started playing drums at 10 years of age, and his love of music and drums led him to pursue a career in radio. In 1950, he gave up a steady job as a clerk at a jewelry store to pursue his dream of a radio career. His first radio job was at WLEA in Hornell, NY. In 1951, Bob returned to CT when he landed a job at WBIS in Bristol. His career skyrocketed when, after three months at WBIS, he moved to Bridgeport, CT, to work first for WLIZ and then WICC, where he held the morning time slot for his entire tenure. He was called out to Hollywood in 1956, when he started at KNX-CBS Radio, where he stayed for nine years, leaving in 1965 after he landed the role of Colonel Hogan on Hogan's Heroes. Despite his success as an actor, Bob stayed close to radio, and in the 1970s, he did part-time work at KMPC. He also guest-hosted radio programs across the country. During his early radio career, Bob began experimenting with sound effects. From there, he graduated to voice impersonations – some famous, some not – and he soon became known as the “Man of a Thousand Voices.” All of these gimmicks, as Bob called them, were interwoven into his radio show, and most of the time, in with commercials, which was unprecedented. By the time he reached KNX, advertisers were paying top dollar for airtime during “The Bob Crane Show,” simply because he could get people to stay put, pay attention to, and actually enjoy the commercials. Also central to Bob Crane’s radio show was his drumming. Wherever Bob went, his drums went with him, and he incorporated his musicianship into his radio program. When playing a record over the air, he could often not resist the urge to play his drums along with it. Further, Bob was an exceptional interviewer, which earned him a coveted place with many celebrities. While at KNX, Bob interviewed more than 3,000 individuals from September 13, 1956, to August 16, 1965. If you work in radio, please include your credentials and station. Please consider officially endorsing Bob Crane's nomination, and encourage your station to endorse his nomination as well. Don't work in radio? Don't sweat it! Simply explain that you are a fan and have listened to Bob Crane's radio work (much of it is available on our Sound Cloud and YouTub Channels — Click the buttons above). Briefly explain what you like about Bob's radio work. As a fan, you also have a voice, and it should be and can be heard! Thank you for supporting a broadcasting legend! in Bridgeport, CT (circa 1953). August 16, 2008. 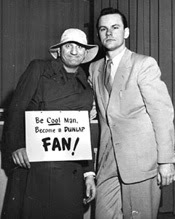 It was a hot, summer weekend in New England, and I was in the thick of researching Bob Crane's life for his biography. During this time, traveling to and from Connecticut was nearly a monthly occurrence for me. I was hopping all over the Nutmeg State, going to libraries, exploring every nook and cranny in search of Bob's story through those who knew him in his early years. And Stratford, Connecticut, is where I first met Morgan Kaolian—pilot, aerial photographer extraordinaire, former Sikorsky Memorial Airport manager, former WICC art director and traffic reporter (affectionately known locally as “Captain Traffic”), creator of Gyro the Robot, owner of Aeropix, and former director of Long Island Sound America, to name just a few of his titles and roles. And—for my specific interest at that point—a former coworker and friend of Bob Crane. Thunderstorms were rolling through in between pockets of sunshine as Dee Young and I sat waiting for Morgan at Knapp's Landing restaurant, situated near the banks of Long Island Sound. To say I was nervous about meeting Morgan is an understatement. Aside from being someone of great importance to the telling of Bob's life story, Morgan was also not entirely sold on participating in the book. Dee, who had known Morgan for most of her life, arranged our meeting so I could hopefully win him over and change his mind. In 2006, when Linda Groundwater reached out to Morgan about being interviewed, he initially agreed to contribute. But after giving the matter more thought, he stepped back. As with so many who knew and loved Bob, Morgan was cautious. If our intent was to ridicule Bob or dwell on his murder, then he wanted no part of it. He only agreed to meet me as a favor to Dee more than anything else. He had, however, also hinted to Dee that if the weather cooperated, maybe we could all take a flight. So while I was nervous, I will admit to also being excited—and optimistic. I remember when Morgan entered the restaurant. Despite the heat and humidity, he was sharply dressed, wearing a tweed blazer and dress pants. Dapper would be the best word to describe Morgan Kaolian. Dee introduced us, and the happy twinkle in his eye somehow reassured me that things were going to be just fine. Morgan slid into the seat across from me, and as we talked, he grew increasingly more interested in our work on Bob's biography. He listened intently to me explain the project's goals and mission—to tell Bob Crane's complete and full story, and not dwell on his murder or promote any type of scandal. The three of us talked for hours, and it wasn’t long before any and all fears on both sides were completely alleviated. 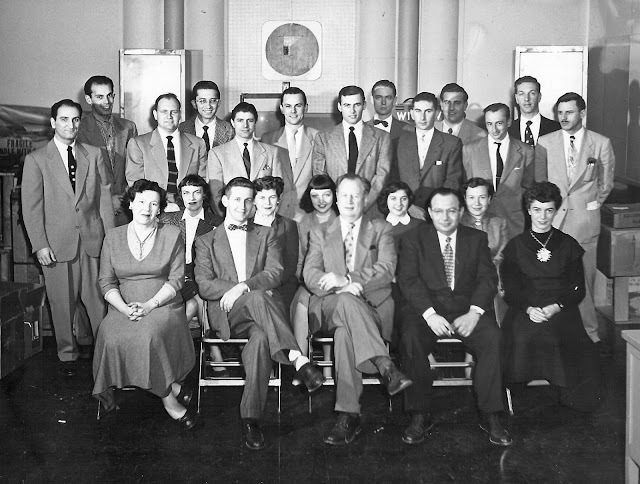 WICC and Channel 43 Staff (1953). Bob Crane is back row, center. Morgan Kaolian is back row, standing, first on the left. Morgan thoroughly enjoyed telling his stories about working with Bob Crane at WICC and specifically on WICC's Channel 43 during the 1950s. His recollections are all included, of course, in Bob Crane: The Definitive Biography. But for instance, Morgan loved talking about the time Bob held up a $100 bill on the air and told the viewing audience that the first person who called would win the money. But—nobody called! Nobody was watching because very few people could afford the bow-tie antenna to receive Channel 43 on the new UHF frequency. 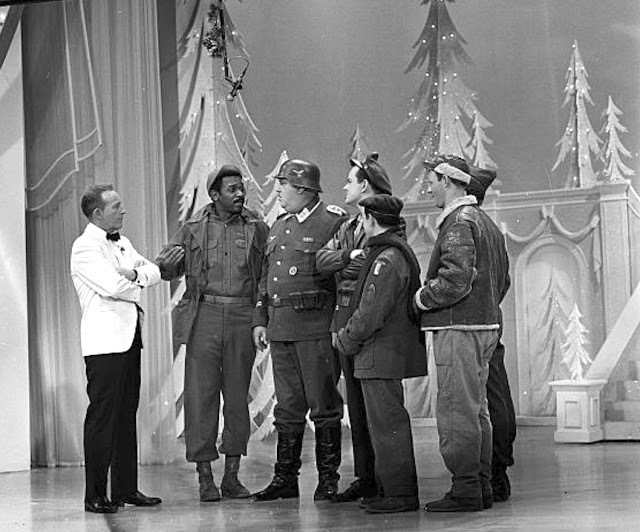 Morgan laughed as he said they basically were performing their Ernie Kovacs-type skits for the cameramen! Morgan was full of stories, and as he told them, he would laugh—more like giggle and chuckle like a school boy—and his eyes would sparkle as he brought his memories to life. After we wrapped up our discussion and paid for lunch (Morgan always insisted on paying for our meals—always), we collected our belongings and made our way out of the restaurant. Morgan was insistent. We were going for a flight! At the time, Morgan owned four airplanes, which he kept in hangars at Sikorsky Memorial Airport in Bridgeport. A life-long pilot, Morgan began flying in the 1940s, even before he learned how to drive a car. He loved flying so much that he made a side career of taking aerial photographs and selling them to clients or submitting them for publication in The Connecticut Post and on other news outlets. On top of that, he gave professional sky rides to the public. For $50, he would take the adventurous up in his Piper J-3 Cub or his Cessna 172 Skyhawk. Within a half hour of leaving the restaurant, we were soaring the Connecticut skies. I was seated up front in the copilot seat. Dee was in the back (aka, back seat driver! "Contact! "), and for the next twenty minutes, all I can remember is a feeling of euphoria. 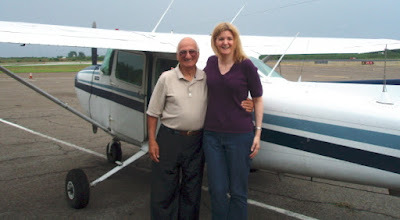 I've flown as a passenger on commercial airliners all of my life; my father worked as a mechanic for the airline industry, and I travel frequently for work. But no commercial flight would ever compare with this! A front-row seat with the ground far below. It was as if we were flying with the angels, and it was, truly, one of the best moments of my life. For more photographs from my sky rides with Morgan, click here. So began my long, eleven-year friendship with Morgan. 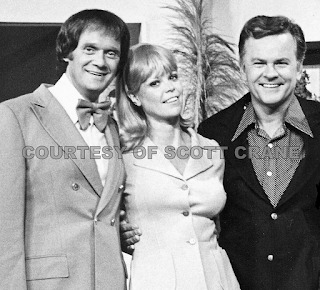 Like so many of those who were a big part of Bob Crane's life, Morgan and I became dearest, most treasured friends. We'd chat on the phone occasionally, too. I'd fill him in on the progress of Bob's biography, tell him about things I had going on here in New Jersey at work or at home, and he'd reminisce about his time at WICC and flying. I'd usually start our conversations with something like, "Hi Morgan! What have you been up to?" He'd always answer, "About a thousand feet!" One of my favorite memories of Morgan was the time he hosted an hour-long tribute to Bob Crane on WICC. Dee was in her office down the hall (Dee was Former Assistant Business Manager for WICC/WEBE before retiring a few years ago), and I was listening online. Dee later told me that in between each segment during the commercial breaks, Morgan would zoom out of the booth, tear down the hall to her office, burst in and ask her, "How am I doing?" And Dee would answer, "You're doing GREAT!" And Morgan would ask, "Is Carol listening in New Jersey?" And Dee would say, "Yup, she is!" And with that, Morgan would spin on his heel and zip back to the booth in time to do the next segment, only to zoom back down the hall to Dee during the next commercial break! You can listen to Morgan's tribute to Bob Crane in the video below. I have grown to love Connecticut so very, very much, and primarily because of the beautiful people I've met and befriended there. Every trip to Connecticut included a visit (and often a flight, until his retirement from flying) with Morgan. I'd stay with Dee and her husband Doug. 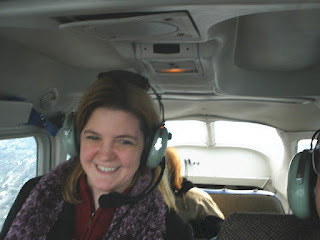 Sometimes we'd go flying with Morgan—like the time in December 2008 when we flew from Sikorsky to Oxford, just for lunch! And sometimes, we'd meet up for dinner or even just a Dunkin' Donuts coffee. Over the past couple of years, Morgan's health began to decline, but he always bounced back. This last time, however, he didn't bounce back. At 90 years young, Morgan passed away peacefully on the morning of January 27, 2019. And a little piece of me died that day with him. 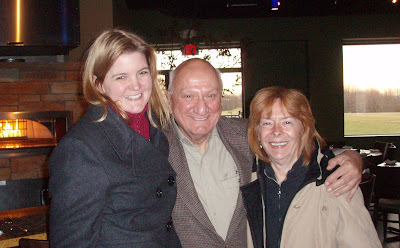 With the loss of Morgan Kaolian, we lost a remarkable man. Morgan was smart. He was funny. He was a skilled aviator and brilliant aerial photographer—he would literally turn the plane on its side while flying to grab the best shots of the landscapes below. He mastered night aerial photography, and in January 2011, his nighttime photos were on display at the City Lights Gallery in Bridgeport. Opinionated but eloquent, he fought for what he believed in, including his dream of restoring Pleasure Beach. Morgan was playful, and witty, and charming. Morgan had a class and style all his own. I have so many memories of fun times spent with Morgan. 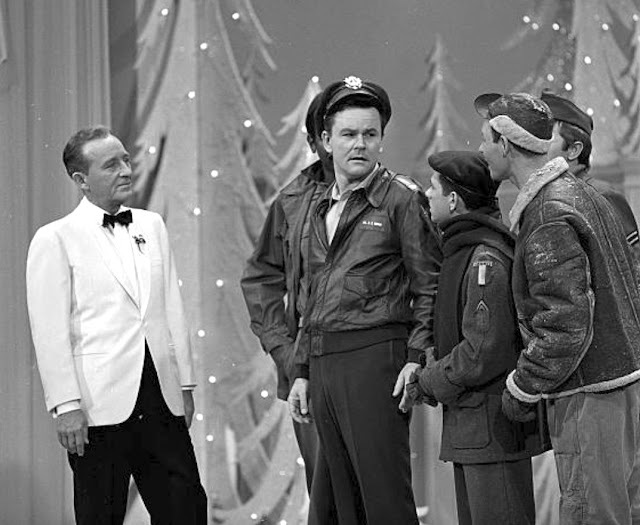 He was an important part of Bob Crane's life and his biography, but he was more than that. So much more. 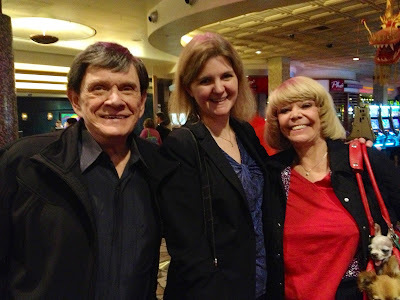 When I visited Connecticut, and Dee, Morgan, and I would get together, we laughed. A lot. Sometimes, when he'd get going on telling his stories, he'd suddenly stop. Mid-sentence. Mid-memory. And he'd kind of look up a little to the right, as if looking directly at the memory that only he could see. And his eyes would sparkle and he'd grin. This knowing, mischievous, school boy grin. But he'd never share whatever it was that made him smile in that moment. I think this was perhaps one of Morgan's most endearing qualities. Some memories are so sacred and special, they are not meant to be shared with anyone else. Rest in peace, Morgan. Now you are flying with the angels. 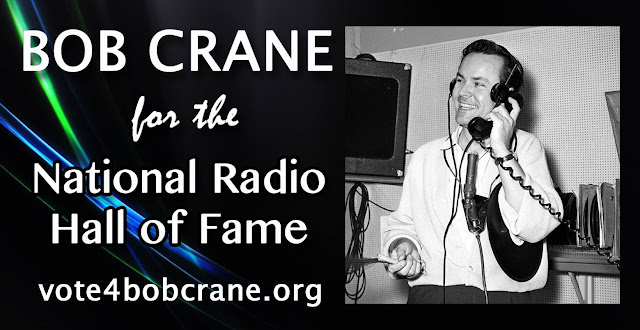 Bob Crane deserves to be inducted into the National Radio Hall of Fame for his tremendous work in the radio/broadcasting industry. We officially nominated Bob in 2011 and have been campaigning for his induction ever since. Our official nomination for Bob is endorsed by WICC (Bridgeport, CT), WLEA (Hornell, NY), WATR (Waterbury, CT), members of the Columbia Square Alumni Group (KNX-CBS Radio, Hollywood, CA), and more. YOU can help by nominating Bob Crane today! Radio stations, radio personalities/DJs, and program directors, please contact us if you would like to endorse Bob Crane's nomination (use the Contact Form — see tab above). Sue Rovens: How has writing changed/altered your life? Carol Ford: In a word: Profoundly. Researching Bob Crane and writing his biography introduced me to some of the most amazing people I have ever had the honor and privilege to know. I wouldn’t trade one second of any of it for the world. These are/were some of the most beautiful and precious people, and I’m not just saying that because they knew or are related to Bob. Each has touched my life and made me a better person in ways I can’t even begin to explain. I’ve also had to sharpen my public speaking skills. Nobody tells you that when you publish a book, especially a biography about a public figure, that you’ll have to give presentations about it, be interviewed on the radio about it, and even go on TV about it! Having written and published Bob’s biography has pushed me way outside my comfort zone to do things I normally would never have had the courage to do. I have come to absolutely love giving presentations about Bob Crane, which I do annually at the MidAtlantic Nostalgia Convention (held each September in Hunt Valley, Maryland) and the Liberty Aviation Museum in Port Clinton, Ohio (home of the official Hogan’s Heroes prop and uniform display). I love watching my audience—and it doesn’t matter if it’s five people or fifty people or a hundred people—absorb what I tell them. Many often attend my presentations with preconceived notions about Bob based on incomplete or inaccurate information, and as I go through his life from birth to death, I can physically see their faces change. They realize how much they didn’t know about him, and they see him in a new light. My favorite story will always be about the first time I gave a presentation at the MidAtlantic Nostalgia Convention. One lady kept coming up to my table in the vendor hall, and she kept saying how much she used to love Hogan’s Heroes, but how she couldn’t watch it because of what she thought she knew of Bob Crane. I was scheduled to give the last presentation of the convention, and I urged her to attend. .She said she’d think about it. So the day came for my presentation (and I was terribly nervous! ), and afterwards, she approached the podium to see me. I recognized her, and I said, “I’m so glad you decided to come!” And she said, and I’ll never forget it, “Thank you. You have changed my negative perception of Bob Crane and given me my show back.” That is when it hits you, that you’re doing more than just writing/publishing a book or going around giving talks. You are righting a wrong. That is why I keep going and will always keep going. 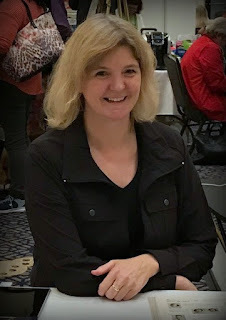 Photos: Top — Carol Ford at the 2018 MidAtlantic Nostalgia Convention. Center — Carol Ford and Linda Groundwater, August 2006, Brisbane, Queensland, Australia, working on Bob Crane's biography. 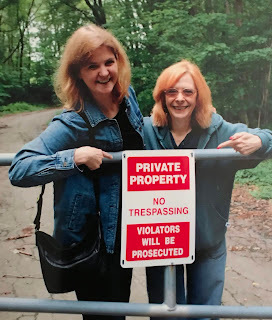 Bottom — Carol Ford and Dee Young October 2008, trespassing and exploring WICC's Booth Hill location, Trumbull, Connecticut. 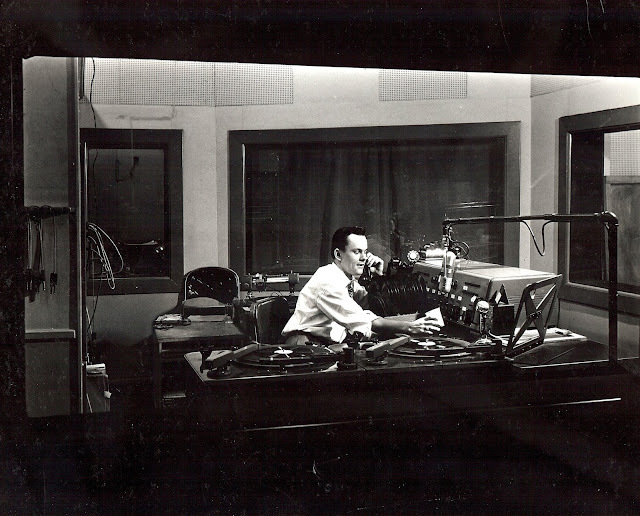 Below — Bob Crane, circa 1951-1952, at the WLIZ/WICC studios, Bridgeport, Connecticut. Happy New Year — Welcome 2019! Last night, the Liberty Aviation Museum rang in 2019 with the Tom Daugherty Orchestra during the museum's 4th annual New Year's Eve 1940's Big Band Victory Canteen Hangar Dance. The Liberty Aviation Museum is the official home of the Hogan's Heroes uniforms and props display, and the orchestra performed the Hogan's Heroes theme song! I love it and wish I could have been there! I love everyone at the Liberty Aviation Museum, and I'll return to the museum in 2019 for more presentations about Bob Crane and book signings of Bob Crane: The Definitive Biography. I'll announce dates soon. Visiting the museum is always a highlight of the year for me because I get to see old friends and make new friends, too, so I hope to see you there! There will also be a big announcement sometime in 2019. But no spoilers...! (Yes, I've been binge-watching Doctor Who!) Stay patient. All in good time. It's the holidays! And like many people, I'm in the holiday spirit! I love everything there is to love about the season—spending extra time with family and friends, sending cards to loved ones near and far, surprising people with gifts, and finding it in my heart to be kinder than necessary and remembering those less fortunate. Christmas music and holiday lights and decorations spruce up my cozy home as I go about cookie baking and gift wrapping. And at night, thanks to modern technology, I can flick on any streaming service and find an array of nostalgic holiday movies and television shows from years gone by. From Rudolph to Frosty to Charlie Brown, and from It's a Wonderful Life to Elf to White Christmas to A Christmas Story, the holidays just don't seem complete until those iconic programs and films play in my home. 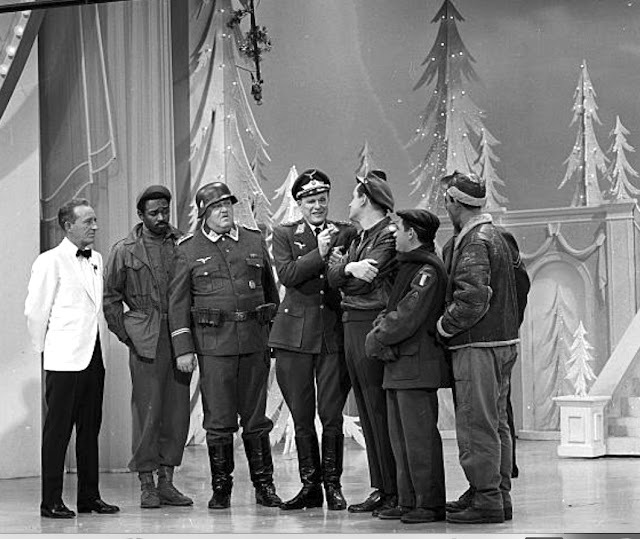 For Hogan's Heroes fans, a never-miss in the holiday line up is The Hollywood Palace Christmas Special, which aired on ABC on December 25, 1965. 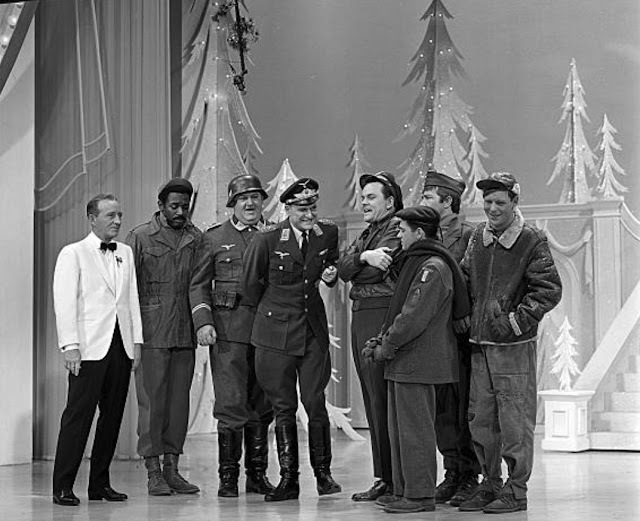 Bob Crane and the cast of Hogan's Heroes are prominently featured in the variety holiday show, hosted by Bing Crosby. Below is the preserved film, along with the program listing, which—fortunately for us—are made available by The Hollywood Palace. 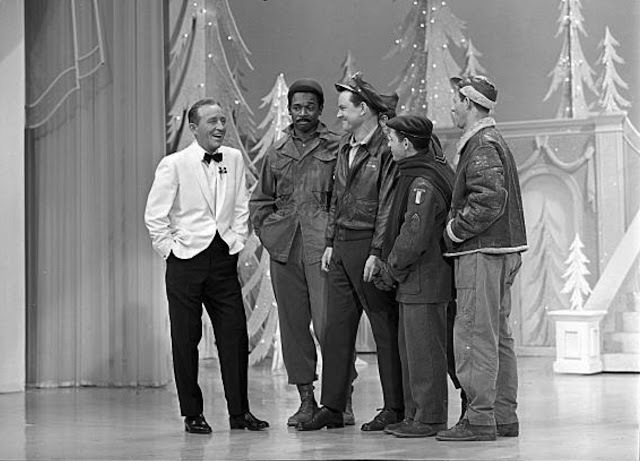 Bing Crosby: "White World of Winter"
Bob Crane, Bing Crosby and Dorothy Collins: "We Wish You the Merriest"
Bing Crosby and Dorothy Collins: "Glow Worm"
Fred Waring and his Pennsylvanians: "Twelve Days of Christmas"
Robert Clary: "French Christmas Song"
Bob Williams and Louie the Dog (humorous animal act): Overly enthusiastic man tries to get his lazy dog to do tricks. 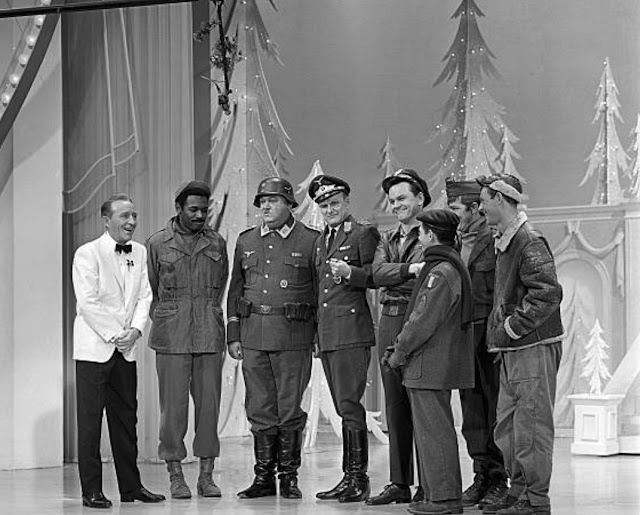 The cast of Hogan's Heroes (Bob Crane, Werner Klemperer, Richard Dawson, John Banner, Robert Clary, Larry Hovis, and Ivan Dixon) joins Bing in a sketch. 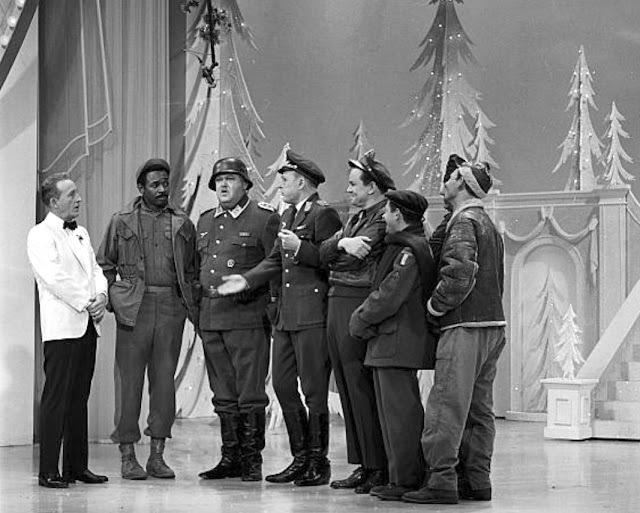 Of course, Bing Crosby, who was a regular host of The Hollywood Palace, also produced and owned Hogan's Heroes. 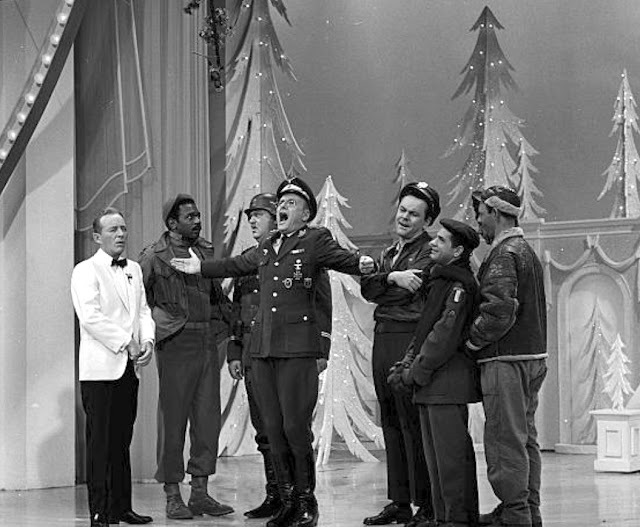 John Banner referred to him as "der Bingle" in this Christmas Special. Banner's affectionate nickname for Crosby is used to this day, and perhaps by some who are unaware of its origins. While it's fairly well known that the main cast of Hogan's Heroes could sing and often performed professionally, what is less known is that Bob Crane also enjoyed singing. We don't get to hear much of his singing except when he is on variety shows such as this one. He also liked to whistle, and once on his KNX radio show, he commented that he didn't know why he whistled all the time, but that he enjoyed it. His classmates from Stamford, Connecticut, also recalled how Bob loved to sing (in addition to all of his drumming! ), and they said he was always singing and/or whistling while walking to and from school. I found it interesting that The Hollywood Palace aired over ABC, while Hogan's Heroes made its home on CBS. It seems a bit unusual to feature an entire cast of a series—and in full costume—from a competing network. So I spoke with television historian Mitchell Hadley, author of The Electronic Mirror: What Classic TV Tells Us About Who We Were and Who We Are (and Everything In-Between!) and owner of the It's About TV website. According to Mitchell, "There isn't anything to suggest there was any kind of an issue between the two networks [ABC and CBS]. 'TV Teletype' (a feature in TV Guide) referred to Vince Edwards appearing on Andy Williams' show on NBC while Ben Casey was still on ABC, which suggests these kinds of cross-appearances weren't that much of a big deal then. 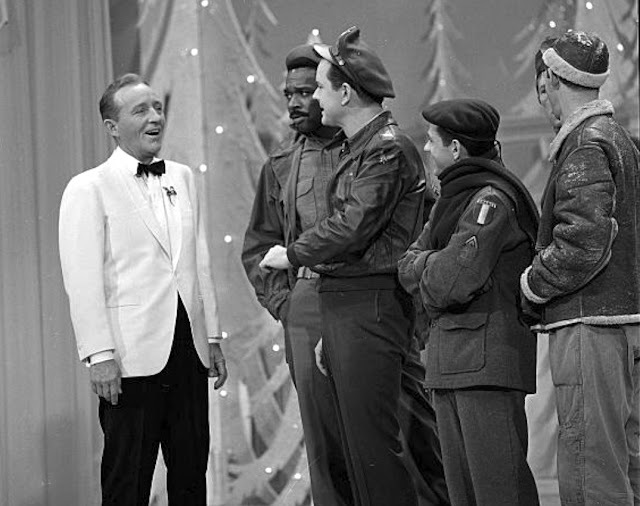 Also, considering Bing Crosby Productions had shows on multiple networks, Crosby probably would have had the clout to make this kind of thing happen. And CBS had recently cancelled Slattery's People, which Bing Crosby Productions produced, so even if they'd even thought of objecting, they might not have wanted to make 'der Bingle' mad—Again, assuming that it was even an issue back then." As a fun side note, I love that Fred Waring and his Pennsylvanians are also a part of this episode. I had the opportunity to meet Mrs. Waring, if ever so briefly. My ex-husband and I lived in the Poconos near Delaware Water Gap in Pennsylvania, which was home to Fred Waring and his Pennsylvanians. One evening back in the mid-1990s, my then-husband Gary and I attended a concert, where Fred Waring and his Pennsylvanians performed. Just as we walked toward the theatre entrance, who should approach but Mrs. Waring! Gary had the honor of holding the door for her, allowing her to enter before us. I guess not much of a story—ha! But he always got a kick out of saying, "I held the door for Mrs. Waring." 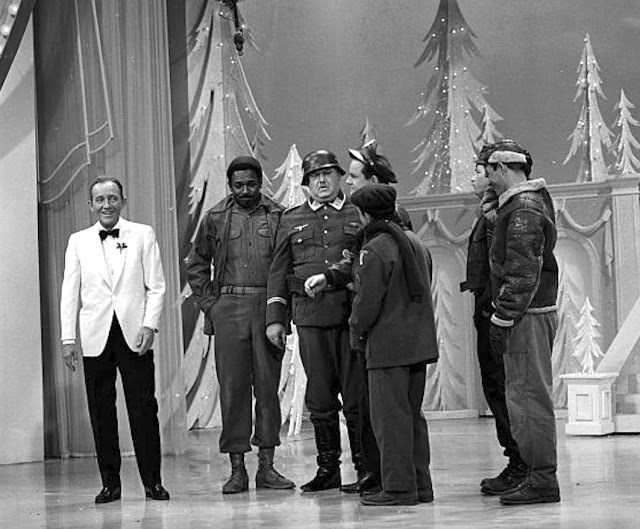 I'll leave you with a few more fantastic stills from The Hollywood Palace's Christmas Special from 1965. All of us here wish you peace, love, health, and happiness this holiday season, and all the best for the new year!